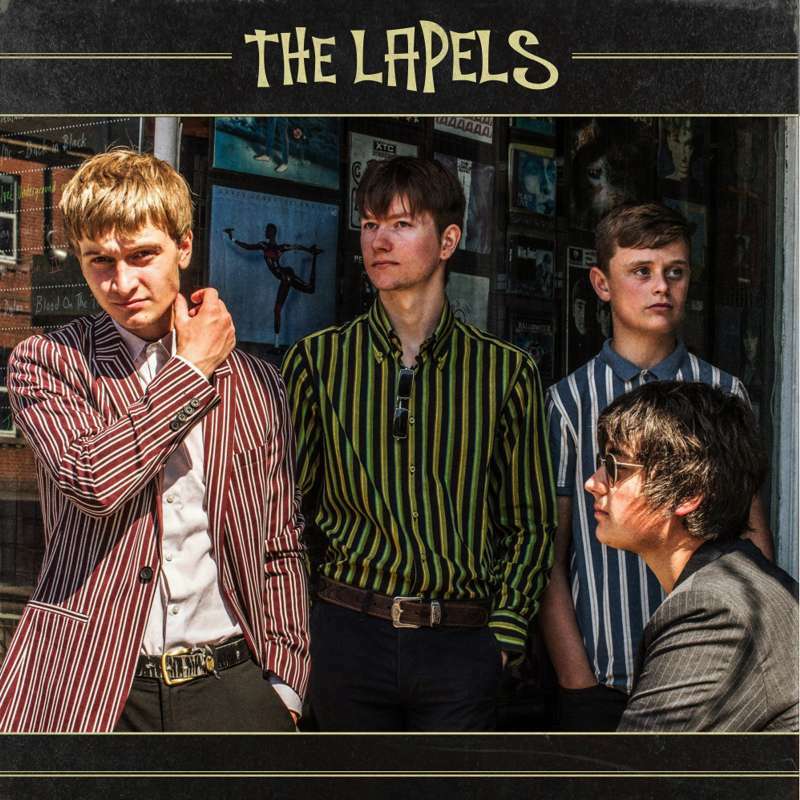 A few weeks ago, I got a message from another British band, The Lapels, about their new single and upcoming events. The band has been going all out for the last year with a recent appearance on the BBC Introducing - East Midlands 'Hot for 2019' show, and they have a new single, "Come And Have A Go", hitting digital platforms and record players (via 45) in under a week on the 19th. I had never heard of these power poppers before, so don't be afraid if this is also you're first time tuning in to them. The cover art for the single is neat and clean with a throwback mod aesthetic of striped shirts. The 60s-styled logo is above as the band looks on while at a record shop. I really like the colors and the contrast. It works well with the retro throwback that The Lapels are going for. The A-side, "Come And Have A Go", is a fast tune with ringing guitars with a heart of machismo, bravado, and camaraderie. I like the song sonically, tension rising and the lyrics being well sung too, but the song has more of that party rock theme, previously discussed in my review of Jack Swing's "Monkey Around", that I'm not that in to. The organ in the background provides an eerie counterpoint to the other instruments and rises, along with the staccato guitar, into a bottle breaking, bringing me to the question, "what is all of this for?". It reminds me of "Private Hell" or the political, "Down in the Tube Station at Midnight", both by The Jam, but this song lacks the ominous dread of the former or the anti-fascist fervor of the latter. Perhaps if the end of the chorus, with what comes off as a provocative threat, was more persuasive, more convincing to the call of battle, I would be more thrilled by this song. The B-side is "This Wretched Town". I like the guitar tone, which again really sounds like The Jam. I wish it was a little more unique, but that's not the end of the world. My biggest issue with this track is that the lyrics are not that strong. The song is about feeling out of place in your small corner of the world and wanting more, a common theme in musick and one that I have related to, as I think most people do. That's all fine, but the actual lyrics are just so-so. There isn't a very interesting meter or rhyme scheme, words often just not rhyming at all, and the end of the chorus is just the phrase, "we're meant for more". Though nothing needs to be incredibly flowery, I wish it had been more poetic. This is a common feeling and theme, something that has been done many times. To state this theme so plainly reduces the impact this song could have. After listening to the tracks thoroughly, I don't love them as much as I thought I would when I heard the first chords of either. The songs have elements of greatness, but, disappointingly, I don't think either track really meets where it needs to. I don't mind the garage/Mod callback, but that, combined with the standardness of the songs, means that none of this really lights my fire as of yet. I think that The Lapels have a lot of potential, and I see them as a band that could move forward into great things. I believe them when they say that they were "meant for more". At the moment though, I can only give their debut, "Come And Have A Go", a Neutral. If you are more inclined to drunken ribaldry than I am, be sure to check out The Lapels on Facebook or their personal site and watch for their upcoming shows across Britain this February and beyond. While I was not the keenest on these tracks, I think this band would be really fun to see live and would love for them to come to the United States, Pittsburgh in particular of course. Maybe we'll see that in the future.